The Trump bill eliminated the loss carryback rules, it did not eliminate the rules under the Mitigation Section. Taxpayers who are forced to repay false profits may still reduce the income falsely reported in the prior years, if that provides a larger tax refund than the refund that would be available if the "clawed back" funds were only allowed to be deducted in the year of payment. This tax benefit cannot be overlooked. Starting in 2018, it is critical to compare the amount of refunds on a Clawback of profits with the value of deducting the Clawback amount in the year it is paid back. Has the Trump Tax Cut and Jobs Act made business theft loss deductions and losses less valuable? Ponzi Scheme Theft Losses may have become less valuable for tax purposes because of the Trump Tax Cut and Jobs Act that was signed into law in December of 2017. That tax bill lowered tax rates in the future and also reduced the value of Ponzi theft loss deductions by eliminating the right to carry back losses and receive tax refunds from earlier years. Loss carrybacks have been eliminated. There are only loss carry forwards available from 2018 forward. Assume a wealthy investor had profited from Ponzi Scheme income in one of the states with high taxes and in a tax year where that total income tax was more than 50% due to the effect of the combined top rates of say New York City, State and Federal income taxes on Ponzi Scheme $500,000 of earnings per year. Assume this occurred every year for three years starting in 2015. The Taxpayer will pay total taxes of $750,000 over the three-year period (2015 to 2017) on the profits. Assume in 2021 that taxpayer learns that the $1,500,000 in profits for the years 2015, 2016, and 2017 was illusory and never existed. Assume in 2021 that the taxpayer now has a theft loss deduction of $1,500,000 because the gross profits were left in the Ponzi Scheme and ultimately lost by that taxpayer. Now, assume that by 2021 the taxpayer has retired to one of the United States that has no city or state income taxes; and assume the retired taxpayer has a reduction in income and now pays taxes in the 20% tax bracket. As a result of the new tax cuts, the Ponzi theft loss deduction that is allowed on the $1,500,000 loss may be worth only $300,000 in refunds at a 20% tax rate. The taxpayer in this example will have paid taxes on taxable income equal to fifty cents on a dollar ($750,000), and will receive tax refunds at twenty cents on the dollar, ($300,000). Furthermore, the taxpayer may need to wait many years into the future since there is less taxable income in each of the later years upon which to collect the refund. The Ponzi Scheme Victim must be aware that the Loss Carry Backs have been Eliminated. With the elimination of Loss Carry Backs under the new tax bill, it is important for Ponzi Scheme losses that could be deducted in 2016, 2017 to be carefully studied. Refunds Can be as high as 37% return for each dollar of loss as high as 37% and 39.6% for losses discovered prior to 2018 – plus additional refunds from state income taxes. Note, these refunds may also be lower in value in the future due to reduced tax rates that apply under the Trump Tax Bill. The Trump Tax Bill provides for an Unlimited Carry Forward as opposed to prior rules with a 20-year limitation. This is an updated PODCAST on the topic and includes Tax Cut and Jobs Act of 2017 modifications for Ponzi Scheme victims. ADDITIONAL RESOURCES: This is an article written by Richard S. Lehman, and it provides a more lengthy description of several of the principals discussed in the Ponzi Scheme Theft Losses, originally published in BNA February 2011 Article. 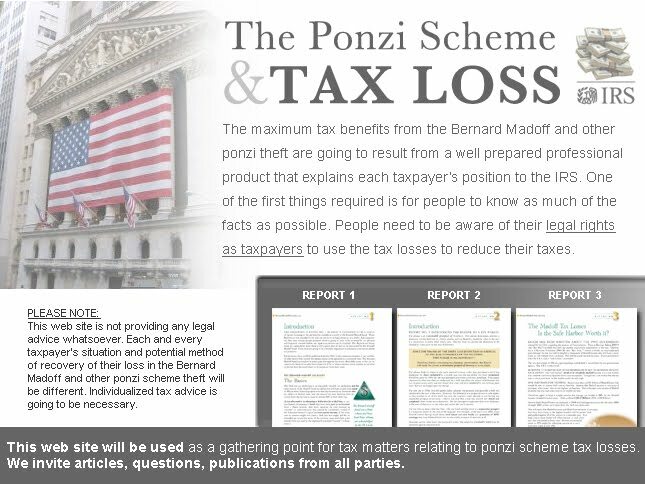 TAX MANAGEMENT BNA Real Estate Journal Vol 27, No2, Feb 2011 Ponzi Scheme Tax Losses download article here. Richard Lehman has posted four new segments on Ponzi Scheme Tax Loss. These segments are short and concise.